Exploring Writing: Sentences and Paragraphsserves as a guidebook for every step of the writing process. Emphasizing both process and practice, with a focus on revision, the new second edition helps to apply and advance writing skills using John Langan's proven techniques. 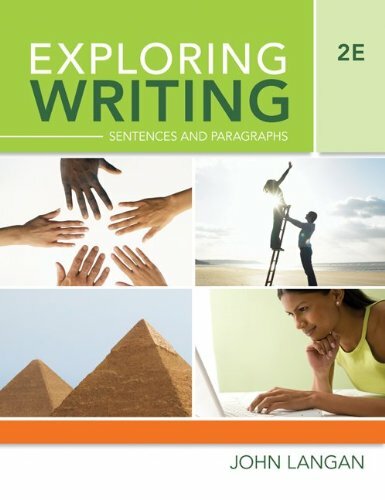 Mastering essential sentence skills, learning to write effective sentences, paragraphs, and essays, and becoming a critical reader are turning points for every writer, and they will prepare the students for writing situations in college and beyond. Why Does Your Attitude toward Writing Matter? How Do You Reach the Goals of Effective Writing? What Are The Steps to Writing Effective Paragraphs? Sister Helen Mrosla, "All the Good Things"
Ben Carson, "Do It Better!" Janny Scott, "How They Get You to Do That"
Grant Berry, "A Change of Attitude"
Beth Johnson, "Let's Get Specific!" Katherine Barrett, "Old Before Her Time"
Amy Tan, "The Most Hateful Words"
Bill Wine, "Rudeness at the Movies"